You need to configure the account settings online to allow IMAP (and/or POP3) at Gmail settings. This needs configured only the first time you use Gmail. You need to use Allow less secure apps if you don't use 2-factor authentication, but 2-factor may need an app password if your version of Outlook doesn't ask for the second authentication. Proper support for 2-factor was added to Outlook 365 in Fall 2018. If you let Outlook configure your Gmail account, it will set it up as IMAP. If you don't want to use IMAP you'll need to configure the account manually. Use your full Gmail address, including @gmail.com or @your_domain.com as the username. If you enabled two-factor verification on your Gmail account, you need to use an app password in Outlook. See "Using Outlook with 2-step verification" for more information. If you don't use two-factor authorization on your Gmail account, you need to Allow less secure apps in Gmail settings at the end of the Gmail Security options page. See Gmail in Outlook: unable to connect to email for more details. In More Settings, Advanced tab, set the Incoming server to use SSL encryption. This will automatically change the port to 995 for POP3 or port 993 for IMAP. The Outgoing server supports a couple of options. If you use Outlook 2016 (or another client that support STARTTLS) use STARTTLS and port 25, otherwise use port 587 and TLS encryption. 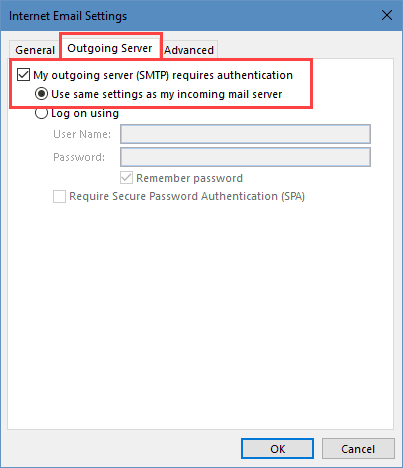 On the Outgoing Server tab, select My outgoing server (SMTP) requires authentication and Use the same settings as my incoming mail server. Note: this screenshot is from Outlook 2016; options on the lower half of the dialog in other versions will vary. Beginning with Outlook 2007, you can choose a Sent folder for your IMAP accounts. While there is no problem using a folder on the IMAP server with most IMAP accounts, you DO NOT want to save a copy of sent items in the Gmail folders. Saving a copy in the Gmail folders will result in two copies of Sent Messages. If you use Gmail's SMTP server, Gmail will put a sent copy in the [Gmail]/Sent Mail folder automatically. Either configure Outlook to not save sent copies of the Gmail mail or Save it in your local sent folder. Saving a copy locally will result in two copies of the sent message (one local and one saved by gmail online), but this is necessary if you use BCC and later want to check who a message was sent to. 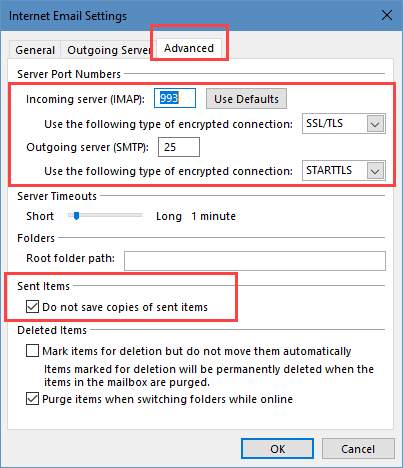 Beginning with Outlook 2013, you cannot choose the Sent folder; Outlook asks the IMAP server which folder it should use. If the server supports XLIST or enhanced-list, or Outlook can match a folder on the server to it's folders by name, sent items will be stored in the Sent folder on the server, otherwise they will be in the local Sent Items folder. In Outlook 2013 (and newer), Gmail uses the Sent folder on the server. This folder is automatically subscribed to your IMAP account; expand the [Gmail] folder to find the Sent folder. Messages sent through the Gmail account will sync down to Outlook on the next sync, or when you open the Sent folder. Outlook 2010 introduced the ability to save Deleted items on the IMAP server. As with sent items, this works fine for most account types but has unintended consequences with Gmail accounts. The problem is with how Gmail manages email, using Labels instead of folders. Labels are converted to folders for IMAP access. Deleting a message removes all labels from the message, leaving the message in the [Gmail]/All Mail folder, which shows all messages, whether or not they are labeled. To delete a message from all folders, you will need to move it to the [Gmail]/Trash folder. Moving deleted messages to your [Gmail]/Trash folder will delete the message in all folders. Deleting a message from the Trash folder deletes it permanently. If you use Shift+Delete to permanently delete messages, they will be deleted in Outlook and from the account online, bypassing the Deleted items folder. They cannot be recovered. Do not configure Outlook to empty deleted items on exit. It can take "forever" for Outlook to close when used with IMAP accounts. Gmail will keep deleted items for 30 days before deleting them permanently. You can control what folders are visible in your IMAP clients by subscribing or unsubscribing from IMAP folders. Right click on any folder in your IMAP account and choose IMAP folders... to open the IMAP folders dialog. Click on the Query button to list all folders or type a few letters in the Query field then click Query to display only folders containing those letters. Folders displayed with a small envelope icon are subscribed, those without the envelope are visible only using your server's web access. Select a folder and click the Subscribe or Unsubscribe button to change it. I do not recommend subscribing to the [Gmail]/All Mail folder. This duplicates all messages in the other folders and will double the size of your data file. Note that the subscribed folder list is stored on the server and will apply to all devices you access using IMAP. You can't subscribe to all folders on your desktop computer and only the Inbox on your tablet or laptop. Do not enable Outlook's junk mail filter. Gmail's spam filters are generally better than Outlook's junk mail filter and using both can result in confusion. You should use the gsuite sync utility with these accounts so calendar & contacts sync... but were you able to get it configured? You need to either allow less secure apps or use an app password (with 2-factor auth enabled) if your outlook build doesn't ask for the 2nd factor. I would just like to thank you for your advice on solving my gmail/outlook 2016 (Office 365 business) account. Having spent probably 12 hours on this over 3 weeks, your solution of changing the outgoing server to STARTTLS and Port 25 did the trick (perhaps along with removing IMAP links to unnecessary Google labels particularly allmail, and cleaning out my google trash folder/s). I am indebted to you and have promoted your web page on this to the Microsoft community forum who weren't able to help me. I Hope you can really help me with my problem. I have my GMail on Outlook 2010 for more than 2 years now, but last week the e-mail was hacked & that caused some problems. I connected with Google Support Team & we went step by step to solve each problem. Last thing we did is that i deleted my gmail account from outlook & re-configured it again. Now after doing this, am facing a problem with the synchronization. In the Send/Receive box, the synchronization keeps working & never finishes. This is the case since last Thursday. This usually get my outlook stuck & it have to close it & re-open it frequently. Any solutions for this problem??? Are there any sync issue messages? Switch to the folder list (Ctrl+6) to see the folder. We used to have another e-mail on another server, but we canceled it, but didn't remove it from outlook for the emails history in addition to that we have to keep it so as not to lose the connection for the new e-mail server (sorry am not an IT so this is as far as i understand about this point). This usually cause that there is error with send/receive for emails not activated. But I have been working with these setups for more than 2 years now & it was OK. It's just now after what i explained above, this problem appeared. Was it set up as pop3? if so, you can remove the email account from outlook but keep the data file. if it was set up as imap, export the mail to a pst file then remove the account from outlook. >> This usually cause that there is error with send/receive for emails not activated. I don't have a problem with the error i receive in Send/Receive for the inactivated accounts. What am facing now problem with is the not finishing - keep loading synchronization for my activated gmail one. When they reconfigured the account, did they use auto account setup or do it manually? I remove the account and add it back using auto-account setup. If that doesn't work, there could be a "bad" message on the server causing problems - this would be a message that was corrupted by the hackers. Are there any messages in the Sync issues folder? no it was manual configuration. I really can't thank you enough for your responses to my problem. It may have been a Gmail issue - I know a few weeks ago there were problems syncing, but AFAIK, that was solved and I hadn't seen any other complaints recently. no there is no error related to this account at all appear. my work email is through Outlook and when I need to email someone with a gmail address Outlook will not deliver it. I was able to until recently. How do I fix this? The error message reads.This message was created automatically by mail delivery software. The recipient server is rejecting the message as it thinks it is infected with a virus or is spam: "Message rejected for spam or virus content". This means your domain or SMTP server could be on a black list - it also could mean something in the message triggered a spam filter, such as a signature or links in the message. I am using Windows 10 and Outlook 2016. I have had a Gmail account forever. Today I began getting a dialogue box that showed the imap.gmail.com input, my gmail email address and asked for my password. Every single password I can think of, including my current gmail password failed. I reset my Google password and that didn't help, so I deleted the email account assuming I could just add it again as a "new" account. When I do that Outlook remembers my old email and password, so I am back to square one except I have deleted my old gmail folders. Wild guess... you got an email from gmail that said you had less secure apps enabled and you took their advice and disabled it. When you do this, you need to enable 2-factor authentication and use an app password in outlook. Please help with following problem: I have Outlook 2016 with a company gmail account synced with G suite sync and another gmail address with IMAP - mails only. 1. How can I add a second (private *.gmail) gmail account which syncs contacts and calendar too? 2. When I add a private hotmail account, it doesn't work. I can only reply to mails I received but I cant write mails to new mail addresses. When I connect my hotmail account only via IMAP, it does´nt sync calendar and contacts. The gmail account should work as an imap account... on hotmail, you may need to make a new profile for that account if you need to sync calendar and contacts. I move from Outlook 2010 to Outlook 2016 (365 Home) and got all my accounts automatically transferred, also Gmail (Imap). For Gmail, I could receive and send but realized that connection with imap folders was not (always ?) working (moving emails out of my inbox in outlook would not mirror in gmail online or app). So I turned to 2FA and created a password app for Mail. deleted the gmail account from outlook and try to recreate it. I get a message that outlook cannot access IMAP with the current encryption method. All gmail imap settings are fine and I tried all combinations.... Any idea how this can be solved ? Did you let auto account setup add the gmail account to your profile? It should get everything correct - and you will need to use the app password if using 2-factor auth. The screenshots show the settings from my gmail account in Outlook 2016. auto account setup added it for me. Outlook 2010 is not allowing me to maunually set up gmail goes to automatically set up the account and then gives an error message ..something went wrong. I think at one stage the message said account is invalid. I have the correct settings in gmail and the verification password is set up. Any suggestions? Is gmail enabled for POp or IMAP access (auto setup uses IMAP)? Are you using 2-factor authentication? Log into gmail.com and see if there are any messages from google - they will sometimes block access if they think its not you. I attempted to bring Gmail into Outlook 2016 and outlook kept prompting me for a password. I can not get passed this problem. However I found out from Googles Help regarding this that Google blocks lesser sercure sources like Outlook from accessing your profile. To overcome this you must go into your Google account and enable the use of lesser secure email clients which Outlook is one. If you choose to enable then they say the risk of hacking into your Gmail account is hightened. I chose not to. Also after a number attempts I got an email from Gmail to say that a less secure App was attempting to sign into my profile and that is how I picked it up in the end. Hope that helps. if you use two-factor authentication, you don't need to enable less secure apps. You will need to use an app password in Outlook though.